synergy effects, the Corsa project center at the headquarters and expectations of the Combo. of the synergies resulting from the integration of Opel/Vauxhall in Groupe PSA will be achieved through purchasing. Opel Post: You presented the PACE! strategic plan around 100 days ago. Are there some initial results already? Michael Lohscheller: We immediately began to address each point because a good plan is five percent of the success, but implementation is 95 percent. And we can see the first results that will help pave the way to success. We have the potential to achieve the three major PACE! 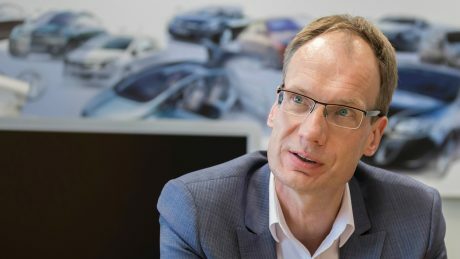 goals: Opel will be profitable, electric and global. Initially, we looked at synergies within Groupe PSA. We already have a new set-up at Purchasing. Working very closely with the concern and through the bundling of the purchasing activities, we can achieve significant economies of scale. 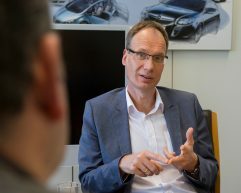 There is a lot of potential here, because in the long term 30 percent of the synergies resulting from the integration of Opel/Vauxhall in Groupe PSA will be achieved through purchasing. Another example that especially impresses me comes from Marketing, the concentration of media spending within Groupe PSA. The market leader MediaCom is working for us this year and all five automotive brands of the group are thus handled in one place. This saves millions in advertising and placement. We are actually moving fast with our export offensive. PACE! aims to double our overseas sales by 2020. To reach this goal, the brand will further strengthen its presence in 15 export markets in Asia, Africa and South America, where it is already present. Above all we are taking a closer look at North Africa. After less than 100 days we already have new importers in Morocco and Tunisia. We are also looking into completely new markets for Opel. The first phase includes Argentina, Columbia, Vietnam, Kuwait and Saudi Arabia. Ten percent of the Opel sales volume will come from outside Europe by the middle of the next decade. What is currently happening at our sites? We have also made major progress in our efforts to make our company more efficient and competitive again. That goes for all sites. For example, in Germany we have agreed with the labour representatives on a “social frame-agreement for a sustainable future” and we are already implementing programmes for early-retirement and senior leave. In the plants we are proceeding step by step, together with the labour representatives, in order to secure the future of the sites. Most recently we concluded a frame-agreement in Spain, linked to the commitment to produce the new Corsa in Zaragoza – also as an electric version. Will this new Corsa unmistakably be an Opel? Absolutely. We took the decision that all Opel/Vauxhall models will be developed in Rüsselsheim. That obviously also applies to the Corsa – both for the versions with conventional propulsion and for the electric car. We have established a dedicated project centre for the new Corsa in Rüsselsheim. Furthermore, we are working hard on defining the areas in which we can establish future “Centres of Competence” within Groupe PSA. We want to announce further Centres of Competence before the end of this quarter. By the way, hundreds of Opel engineers have already taken over tasks for Peugeot, Citroën and DS Automobiles that were previously outsourced. And the number is growing. Our Dudenhofen test centre also benefits from the closer cooperation; we are already performing the first tests there for the group’s brands Peugeot, Citroën and DS, on the high-speed circuit, for example. Michael Lohscheller has been at the helm of the tradition-rich automaker Opel since June 2017. Since September 2012, he was responsible for the automaker’s finances. 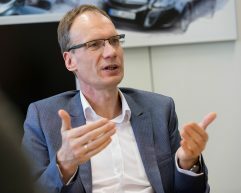 Before joining Opel, Lohscheller was Executive Vice President and CFO at Volkswagen Group of America, where he led a successful turnaround driving significant growth and profit increase. The passionate runner, born on November 12, 1968, is married with two children. Enablement and Empowerment of Employees. Which new models will give us momentum this year? The international media launch of the Insignia GSi is currently taking place and I am certain that this car will be really well received. Our sporty flagship with 260 hp is more of an athlete than a muscle-car. That is immediately obvious where lateral forces sort the wheat from the chaff. On the Nürburgring-Nordschleife our finely tuned “grip-master” leaves far more powerful rivals trailing in its wake. This is what makes PACE! fun! … a joint project together with the Peugeot and Citroën brands. Until now we have been under-present in the market for high-roof vans, which accounts for around one million units in Europe. That will now change. Family vans in particular have huge potential and the Combo suits our long tradition of versatile, practical vans very well. Regardless of whether as a Combo Life for families demanding spaciousness and comfort, or as a transporter. High-roof vans have the potential to become a source of high growth for our brands. Does that mean the implementation of PACE! is on track? PACE! is progressing, step by step. We have already achieved a lot but we are still a long way away from our final goal. We are facing further major changes this year because one thing remains clear: The status quo is not an option. We have lost money for far too long and it is time to finally make our business sustainably “weatherproof”.